Hey there! 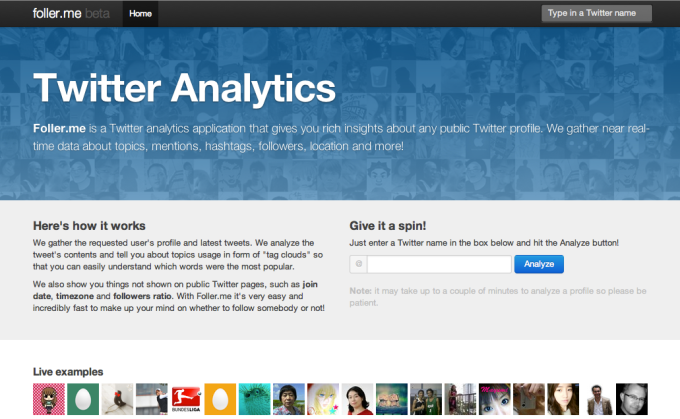 I just released a brand new WordPress plugin called Twitter Embed. 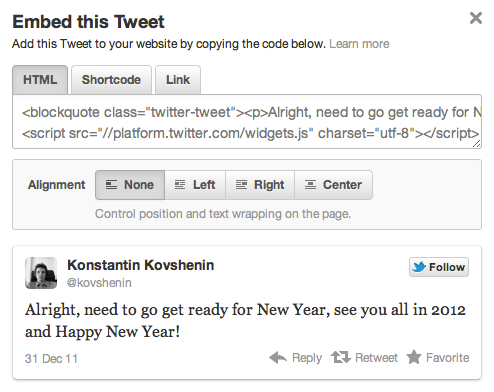 It supports several ways of embedding tweets into your WordPress posts and pages. The new (new-new) Twitter interface has introduced a new link on tweets called “Embed this Tweet” which allows embedding through HTML code, shortcode or link. This plugin implements all of those ways. It will even reverse an embed HTML into a shortcode if the user doesn’t have privileges to post unfiltered HTML. It caches the API responses from Twitter.com for better performance and well, it’s as simple as it looks and sounds, doesn’t require any configuration and works out of the box, right after activation. Download it from the WordPress.org Plugins Directory, give it a spin and let me know if it works for you. Cheers and Happy New Year! 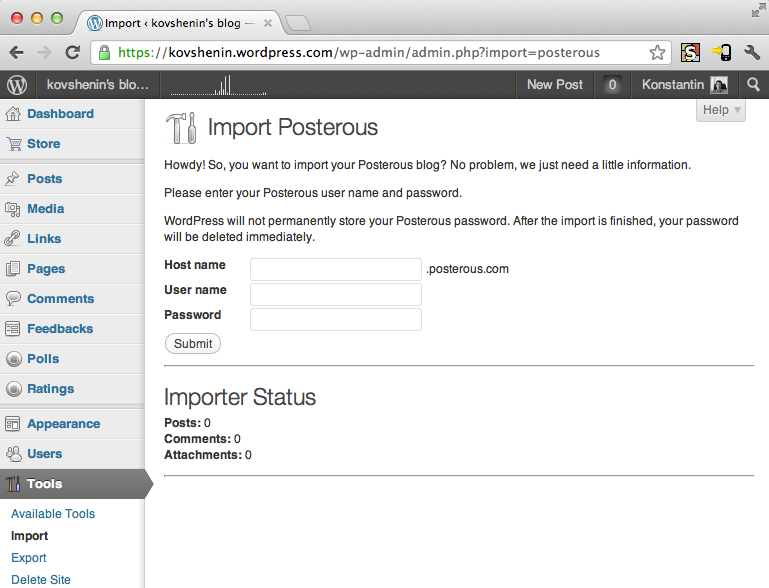 Foller.me is Back Online, and now Filled with WordPress Goodness! The (yet another) new version of Foller.me is powered by WordPress, so if you’ve got friends who still think WordPress is for blogs only, share this with them. Instead of inventing a new user interface I went with Bootstrap and was able to prototype the whole thing really, really fast. I removed the followers geography part for now, I’ll need to find a better way to lay that out and make it actually function. Meanwhile you can enjoy two brand new sections. Here’s a Thanksgiving surprise I got from Twitter today. Seriously, I’ve got a dozen accounts for brands and experiments I run using the Twitter API, but never on my own and funny thing, the rest are fine but mine’s suspended, and no single e-mail from them in my inbox! Contacting Twitter support, let’s see what they have to say. Anyhow, this post is not about twitterfeed, spam or whatsoever, but it is about unwanted tweets in your timeline. Tweets in a language that you can’t read. I myself sometimes tweet in Russian and are worried about my followers that don’t understand that, so I try to keep it at a minimum and mostly @ replies. This is good, but what if you really need to tweet in two different languages? Russian president Dmitry Medvedev has got two accounts, @MedvedevRussia and @MedvedevRussiaE and does the tweeting separately. I guess others do it the same way, but hey, what if you’re tweeting in 5 different languages? And what about 10? Yes, Tweetdeck and other software can use Google Translate to translate the tweets, but that doesn’t work out quite well. What if I can speak two languages? I don’t need that fuzzy Russian to English translation, and believe me, neither do you! I got a proposal to make this end. An easy one and a difficult one, and we’ll start with the easy one: attach a language code as an @ reply to the beginning of your tweet if it’s language specific, and to be able to read these sort of tweets you can follow that specific language code. @ru My text in Russian goes here, whoever is not following the Russian language code will not see this. @de My German message goes here, people not following that code won’t see it. Here’s why it works. Twitter @ replies are public, but users don’t see them in their timelines unless they’re following both parties — the one issuing the message and the one mentioned in the message. I think this was one of the crucial changes to Twitter to reduce unwanted stuff in the public timeline, and almost resulted in a #followfriday fail. Second option (the difficult one) is to get Twitter to introduce languages for tweets. I know they did this with Twitter Search and it seems to work okay, but this time there has to be something better — perhaps use Google to identify what language the tweet was issued in. And have profile settings where you can select the languages you’d like to see in your public stream. I came across this issue a few days ago and started looking for solutions. Didn’t find too many decent ones, which is why I’m writing this post. I’ve implemented Twitter’s Tweet Button on Foller.me last week and noticed that it always shows 0 count, despiting the fact that the page has been tweeted 3-4 times. My friends suggested to wait a while, but that didn’t help either. Count was still showing zero after 3 days, so I decided to inspect of what’s going on. That was quite easy ;) Too bad the Twitter developers docs don’t mention this at all, and a Google search for Twitterbot shows you how to create your own Twitter robot ;) Thanks for sharing this, cheers!